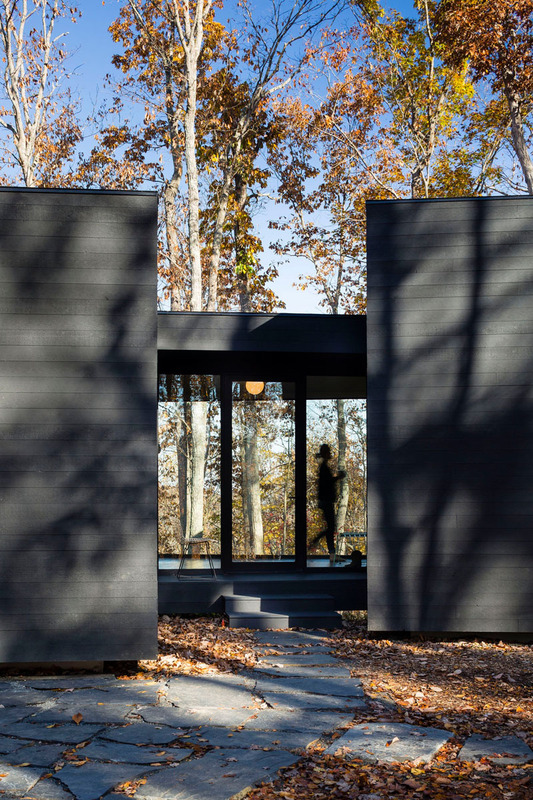 This home in the woods is simple but very unique. Living in a house surrounded by trees would surely be refreshing because nothing beats being near nature and the environment. That is why some homeowners prefer to live in the middle of the woods. Apart from the environment, one reason why some people want to live in the woods is because of the privacy they can get there and it is free from all the noise from the city. We have featured many homes in the woods and we can see that all of them indeed looked refreshing and very relaxing. Today, we are going to feature another home that is located around forest trees. 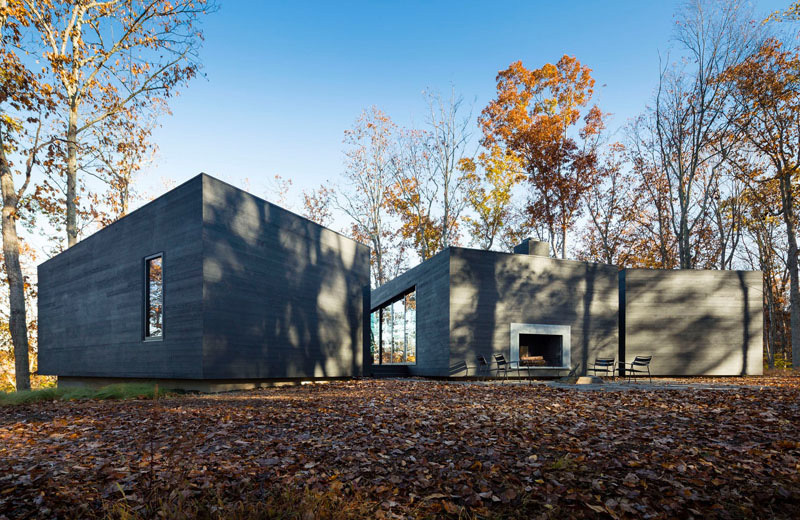 A home called the James River House is designed by Virginia based architects, ARCHITECTUREFIRM. 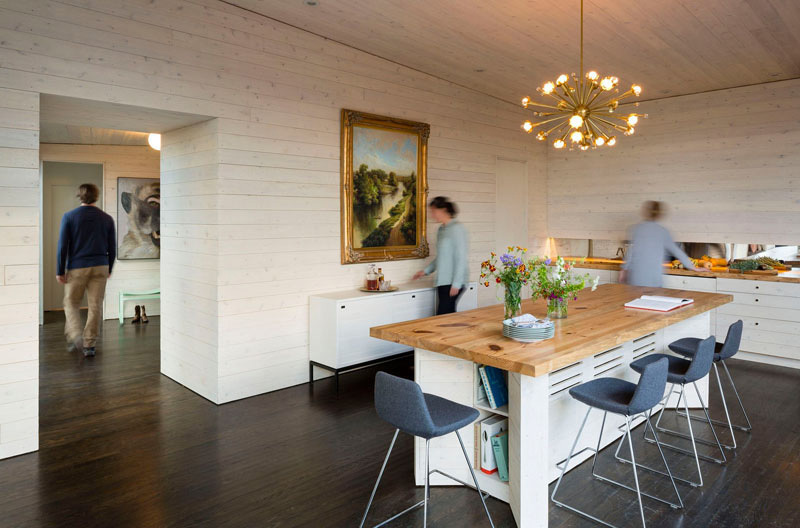 This river house is located on a wooded site for a family with three young boys. In order to reach the house, one needs to take an almost 1/2 mile long drive through the woods. What welcomes guests is the studio/garage, where they can leave their cars and walk to the house. This provides a feeling of hiking into the house while seemingly walking away from the city life. The design of the house also looks perfect with the natural feel around it. And it also links the interior and the exterior really well which makes it a perfect place for the family. Let us take a look at photos of the house below. Unique feature: A beautiful and unique contemporary home located in the woods featuring geometric lines and unique architectural design. Apparently, this isn’t like the typical house that we see in our neighborhood. It has a unique modern look for its architecture while using wood in black finish. The home is split up into three different areas. In the middle area, the kitchen and the living room are located while another area houses the parents and kids bedrooms. Aside from that, there is also a third area for guests. There are glass windows and doors that allow natural light inside the house. It also has a hallway that connects the living/kitchen and dining area to the entryway, and then on to the bedrooms. 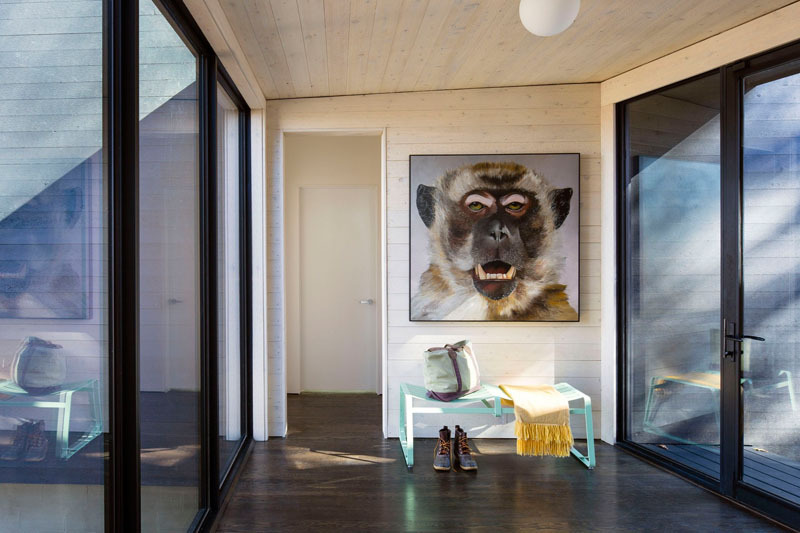 For sure, that monkey portrait caught your attention at first glance because who wouldn’t notice it anyway? It is a good idea to put up a huge wall decor in a blank wall. Below it is a mint green bench which is a good spot to sit or place one’s stuff upon arrival in the house. This is the living area of the house. Notice how relaxing it looks like because of its comfy chairs and the design of the area rug. Also, one can get a good view from here while letting natural light in. Also seen in the living area is a large kitchen island which doubles as a dining table. Isn’t it nice that the kitchen table here has storage spaces under it? It looks even nicer because of the gray chairs. The kitchen area used for preparing and cooking food can be seen here through a small gap in the wall. This is the kid’s bedroom that has built-in bunk beds that can easily sleep eight children. This is indeed a nice place to keep all the kids together in one space. It is easier to check them this way. Apart from the wooden bunk beds, there is a tall glass window in here that will bring natural light to bedroom. Tall glass windows are seen all around the house. 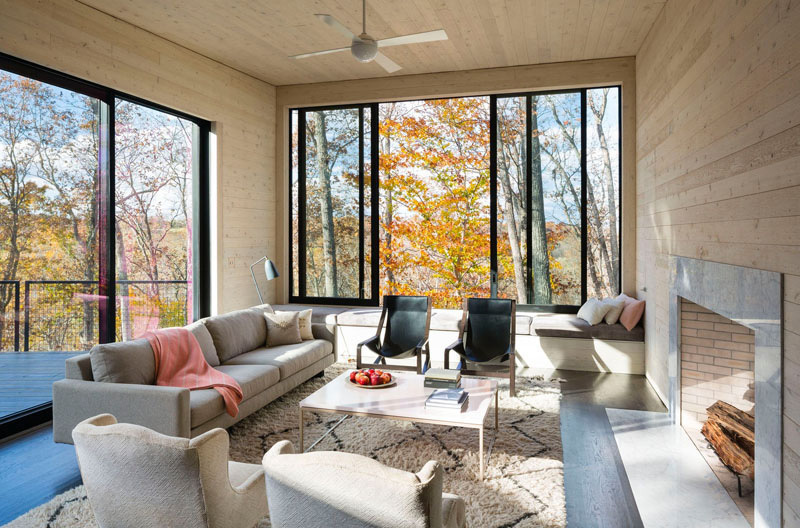 From the living area which has an open layout, one can directly see the wooden deck outside as well as the tall trees in the woods. To access the deck, sliding glass doors can be opened. This way, there will be a seamless connection between the indoor and outdoor area. This is the deck with a pair of wire mesh chairs and a log table. On the other side of the deck is the guest area that overlooks the forest. Guests are greeted by a stone paved outdoor area wherein a fireplace is built into the design of the house. It would be nice to rest in this place, right? This is a shed which is detached from the house. It stores various items and can be accessed thru a wooden sliding door. 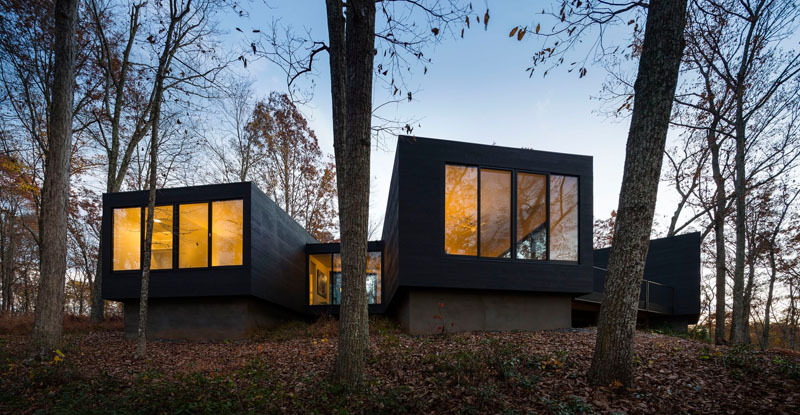 The James River House is indeed a unique home designed by Architecture Firm which made use of geometric lines and other modern elements. The arrangement of the house is also very distinct but practical and functional. It is also nice that the home is connected to the outdoor area through the deck as well as the space with stone pavers and a fireplace. In the interior, it looks very relaxing with its simple design. I also like the usage of texture inside the house which makes it even more relaxing and warm. And of course, the tall glass windows allow the entry of natural light. How about you, do you love this house? What are its features that you love the most?